Brundtland, Terje 2018. Of men and instruments: The Norwegian Aurora Expedition to the Arctic, 1902–1903. Polar Record, Vol. 54, Issue. 01, p. 53. 2015. A Companion to the History of American Science. p. 566. POSKETT, JAMES 2015. Sounding in silence: men, machines and the changing environment of naval discipline, 1796–1815. The British Journal for the History of Science, Vol. 48, Issue. 02, p. 213. Saito, Fumikazu and Dias, Marisa da Silva 2013. Interface entre história da matemática e ensino: uma atividade desenvolvida com base num documento do século XVI. Ciência & Educação (Bauru), Vol. 19, Issue. 1, p. 89. Withers, Charles W J 2013. Science, scientific instruments and questions of method in nineteenth-century British geography. Transactions of the Institute of British Geographers, Vol. 38, Issue. 1, p. 167. Taub, Liba 2011. Introduction: Reengaging with Instruments. Isis, Vol. 102, Issue. 4, p. 689. Schaffer, Simon 2011. Easily Cracked: Scientific Instruments in States of Disrepair. Isis, Vol. 102, Issue. 4, p. 706. Bud, Robert 2010. Science for the Nation. p. 11. Hayton, Darin 2010. Instruments and demonstrations in the astrological curriculum: evidence from the University of Vienna, 1500–1530. Studies in History and Philosophy of Science Part C: Studies in History and Philosophy of Biological and Biomedical Sciences, Vol. 41, Issue. 2, p. 125. Taub, Liba 2009. On scientific instruments. Studies in History and Philosophy of Science Part A, Vol. 40, Issue. 4, p. 337. Mosley, Adam 2007. Objects, texts and images in the history of science. Studies in History and Philosophy of Science Part A, Vol. 38, Issue. 2, p. 289. Biagioli, Mario 2006. From Print to Patents: Living on Instruments in Early Modern Europe. History of Science, Vol. 44, Issue. 2, p. 139. Hicks, Robert D. 2001. The Interpretation of Measuring Instruments in Museums. Curator: The Museum Journal, Vol. 44, Issue. 2, p. 179. Whitaker, Robert J. 2001. Harmonographs. I. Pendulum design. American Journal of Physics, Vol. 69, Issue. 2, p. 162. Berge, Ann La 1999. The History of Science and the History of Microscopy. Perspectives on Science, Vol. 7, Issue. 1, p. 111. Higton, H. 1998. Instruments of science: an historical encyclopaedia. Endeavour, Vol. 22, Issue. 4, p. 164. 1997. Essay review. Annals of Science, Vol. 54, Issue. 2, p. 197. Blondel, Christine 1997. Electrical instruments in 19th century France, between makers and users. History and Technology, Vol. 13, Issue. 3, p. 157. What is a scientific instrument, when did it become one, and why? 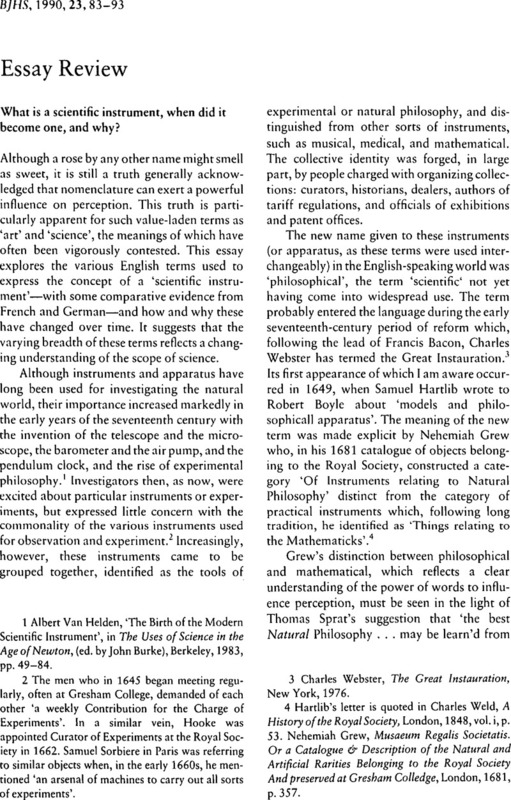 1 Van Helden, Albert, ‘The Birth of the Modern Scientific Instrument’, in The Uses of Science in the Age of Newton, (ed. by Burke, John), Berkeley, 1983, pp. 49–84. 2 The men who in 1645 began meeting regularly, often at Gresham College, demanded of each other ‘a weekly Contribution for the Charge of Experiments’. In a similar vein, Hooke was appointed Curator of Experiments at the Royal Society in 1662. Samuel Sorbiere in Paris was referring to similar objects when, in the early 1660s, he mentioned ‘an arsenal of machines to carry out all sorts of experiments’. 3 Webster, Charles, The Great Instauration, New York, 1976. 4 Hartlib's letter is quoted in Weld, Charles, A History of the Royal Society, London, 1848, vol. i, p. 53. Grew, Nehemiah, Musaeum Regalis Societatis. Or a Catalogue & Description of the Natural and Artificial Rarities Belonging to the Royal Society And preserved at Gresham Colledge, London, 1681, p.357. 5 Sprat, Thomas, History of the Royal Society, London, 1667, pp. 71, 121. Note that Sprat's famous frontispiece depicts such practical instruments as quadrants and sectors along with such philosophical instruments as telescopes and air pumps behind the figures of Lord Brouncker, Charles II, and Francis Bacon. 6 Quoted in Taylor, E. G. R., The Mathematical Practitioners in Tudor and Stuart England, Cambridge, 1954, p. 4. 7 Webster, , op. cit. (3), p. 486. 8 Bennett, J. A., ‘The Mechanicians and the Mechanical Philosophy’, History of Science. (1986), 24, 1–28. 9 Hunter, Michael, Science and Society in Restoration England, Cambridge, 1981, p. 58. 10 Shapin, Steven and Schaffer, Simon, Leviathan and The Air-Pump. Hobbes, Boyle, and The Experimental Life, Princeton, 1985. 11 Boyle, Robert, Some Considerations Touching the Usefulnesse of Experimental Natural Philosophy, Oxford, 1664, Book II, pp. 18–29. 12 Porter, Roy et al. , Science and Profit in 18th-Century London Cambridge, 1985. 13 Quoted in Millburn, John R., Benjamin Martin. Author, Instrument-Maker, and ‘Country Show man’, Leyden, 1976, p. 38. See also Desaguliers, J. T., Lectures of Experimental Philosophy, London, 1719, Whiston, William, A Course of Mechanical, Optical, Hydrostatical, and Pneumatical Experiments, (n.d.), Nollet, J. A., Leçons de Physique, Expérimentale, Paris, 1745, and Gravensande, G. J. 's, Physices Elementa Mathematica Exerperimentis Confirmata, Leyden, 1721. 14 Schaffer, Simon, ‘Natural Philosophy and Public Spectacle in the Eighteenth Century’, History of Science, (1983), 21, pp. 1–43. Daumas, Maurice, Scientific Instruments of the Seventeenth and Eighteenth Centuries, New York, 1972, especially Part Two, chapter IV, ‘The Collections of Philosophical Instruments’. 15 According to a private communication from Michael Crawforth of Project Simon, Glynne's advertisement is in Gordan, G., An Introduction… to Geography, London, 1726, and Hickman's advertisement is in the Daily Advertiser, 27 06 1747. 16 Warner, Deborah Jean, ‘Astronomers, Artisans and Longitude’, in Tekniska Museet Symposium, Transport Technology and Social Change, Stockholm, 1980, pp. 133–140. 17 Hunter, , op, cit. (9), p. 68. Turner, Anthony, Early Scientific Instruments. Europe 1400–1800. London, 1987, chapter VI, ‘Contrasting Collections’. 18 [Whewell, William] review of Mrs Somerville, ‘On the Connexion of the Physical Sciences’ in Quarterly Review, 03, 1834. Whewell, , Philosophy of the Inductive Sciences, London, 1840, introduction. Whewell, , History of the Inductive Sciences, London, 1837, vol. i, preface. Ross, Sydney, ‘Scientist: The Story of a Word’, Annals of Sciences, (1962), 18, pp. 65–85. 19 Bennett, J. A., Science at the Great Exhibition, Cambridge, 1983. 20 First Report of the Department of Science and Art, London, 1854. 21 Home, & Thornthwaite, , A Guide to the Purchase and Use of Scientific Instruments, London, 1857. Murray & Heath advertised as ‘Manufacturers of Scientific, Chemical and Physical Apparatus to Her Majesty the Queen’ in The Photographic News, 1858. , R. and Beck, J., An Illustrated Catalogue of Scientific Instruments, London, 1865. Casella, L. P. is listed as ‘Scientific Instrument Maker to the Admiralty’ on the title page of his Illustrated and Descriptive Catalogue of Surveying, Philosophical, Mathematical, Optical, Photographic, and Standard Meteorological Instruments, London, 1871. 22 Holbrook's Scientific Apparatus, Berea, Ohio, 1857. See also the evaluation of ‘Common School Apparatus, consisting of Juvenile Instructor, Numeral Frame, Geometrical Forms, Arithmetical Solids, Geological Cabinet, Globe, Tellurion, Orrery, Thermometer, &c.’ by various County School Superintendents in New York State: ‘This is to certify, that after a careful examination of the Scientific School Apparatus …’ cited in Pike, Benjamin Jr., Illustrated Descriptive Catalogue of Optical, Mathematical, and Philosophical Instruments, New York, 1856, i, p. 386. 23 Daumas, Maurice, ‘Le corps des Ingénieurs brevetés en instruments scientifiques (1787)’, Archives Internationales d'Histoire des Sciences, (1952), 5, pp. 86–96. ‘Liste Generale des Membres’ appended to Bulletin de la Société d'Encouragement pour l'Industrie Nationale, 1824, 23. 24 Lerebours et Secretan, Catalogue et Prix des Instruments d'Optique, Physique, de Chimie, de Mathématiques, d'Astronomie et de Marine, Paris, 1853, advertissement. 25 ‘Maihat’ and ‘Ducretet’ in Syndicat des Constructeurs en Instruments d'Optique & de Précision, L'Industrie Française des Instruments de Précision, Paris, 1901–1902. 26 Doggett's New York City Directory for 1850–51. 27 Deutsche Gesellschaft für Mechanik und Optik, Special Catalogue of the Collective Exhibition of Scientific Instruments and Apparatus, Berlin, 1893. 28 Brachner, A., ‘German Nineteenth-Century Scientific Instrument Makers’, in Nineteenth-Century Scientific Instruments and Their Makers, (ed. by de Clerq, P. R.) Leiden & Amsterdam, 1985, p. 119Payen, Jacques, ‘Les Constructeurs d'Instruments Scientifiques en France au XIXe Siècle’, Archives Internationales d'Histoire des Sciences, (1986), 36, pp. 84–161, excerpted in de Clerq, (ed. ), vide supra pp. 159–182. 29 Jungnickel, Christa and McCormmach, Russell, Intellectual Mastery of Nature, Chicago, 1986, vol. i, p. 63. 30 Arenstein, , Austria at The International Exhibition of 1862, Vienna, 1862, p. 57. 31 Deutsche Gesellschaft für Mechanik und Optik, op. cit. (27)German Educational exhibition, Scientific Instruments, Berlin, 1904. 32 J. W. Queen & Co., Catalogue of Physical Instruments, Chemical Apparatus, Chemicals and School Apparatus Generally, Philadelphia, 1881, preface. 33 Cannon, Susan Faye, Science in Culture, New York, 1978, p. 145. 34 Schaffer, Simon, ‘Scientific Discoveries and the End of Natural Philosophy’, Social Studies of Science, (1986), 16, pp. 387–420. 35 Graham is quoted in Turner, Gerard, Nineteenth-Century Scientific Instruments, London, 1983, preface. Herschel, John, A Preliminary Discourse on the Study of Natural Philosophy, London, 1830, p. 125. Whewell, William, The Philosophy of the Inductive Sciences. London, 1840, ii, book xii. 36 Harman, P. M., (ed.) ‘Introduction’, in Wranglers and Physicists, Manchester, 1985. The quote is from Morrell, J. B. and Thackray, Arnold, Gentlemen of Science, Oxford, 1981, p. 481. 37 Maxwell, J. C., ‘General Considerations Concerning Scientific Apparatus,’ pp. 1–21 in Handbook to the Special Loan Collection of Scientific Apparatus, South Kensington Museum London, 1876, pp. 1–21. 38 For some, however, scientific referred to instruments used for original investigation and professional training, while philosophical referred to those used for ‘demonstrating the laws, principles and facts of physical science’. see J. W. Queen & Co., Priced and Illustrated Catalogue of Physical Instruments, Philadelphia, 1882, preface. 39 ‘Report on Customs Duty on Philosophical and Scientific Apparatus’, Report, National Academy of Sciences, 1884, pp. 65–67. 40 Whewell, , Philosophy of the Inductive Sciences, London, 1840, p. 513. 41 Quoted in Lehrburger, Egon, The Cavendish Laboratory, London, 1962, p. 16. 42 Jungnickel, and McCormmach, , op. cit. (29), pp. 89–90. 43 Gieryn, Thomas F., ‘Boundary-Work and the Demarcation of Science from Non-Science: Strains and Interests in Professional Ideologies of Scientists’, American Sociological Review, 1983, 48, pp. 781–795. 44 For an American example see Molella, Arthur and Reingold, Nathan, ‘Theorists and Ingenious Mechanics: Joseph Henry Defines Science’, Science Studies, (1979), 3, pp. 323–351. 45 Great Exhibition Report of Juries, p. 316. see also Catalogue of the Philosophical Instruments, Models of Inventions, Products of National Industry, &c. &c. Contained in The First Exhibition of the British Association for the Advancement of Science, 1838, and Patent Office of Great Britain, Abridgement of Specifications Relating to Optical, Mathematical, and Other Philosophical Instruments, London, 1875. 46 Cannon, Susan Faye, op. cit. (33), chapter I, ‘Science as Norm of Truth’. For a later example see Paul Forman, ‘The Self-Image of the American Physicist Before and Since the Second World War’, paper presented at Joint Atlantic Seminar for the History of Science, 22 April 1988. 47 Sviedrys, Romuldas, ‘The Rise of Physics Laboratories in Britain’, Historical Studies in the Physical Sciences, (1976), 7, pp. 405–436. Thomson, William, ‘The Structure of Matter and the Unity of Science’, 1871 presidential address to the British Association for the Advancement of Science, quoted in Victorian Science, (ed. by Basalla, G., Coleman, W. and Kargon, R.) Garden City, 1970, p. 103. 48 Cattemole, M. J. G. and Wolfe, A. F., Horace Darwin's Shop: A History of The Cambridge Scientific Instrument Company, 1878 to 1968, Bristol & Boston, 1987. Ladd, William in Nature, (1869), 1, p. 38. Buff, and Berger, , Catalogue of the Engineers' and Surveyors' Instruments, Boston, 1889, noted that, in addition to their regular work, ‘We have made and do make scientific instruments’. By the 1920s in England there was also the Endicott Scientific Instrument Co., and Heath & Co., Ltd at the New Eltham Scientific Instrument Works, while in the U.S.A. there were such companies as the Central Scientific Co.
49 ‘List of Apparatus Available for Scientific Researches Involving Accurate Measurements’, Harvard College Library Bulletin, (1879), 11, pp. 301–4, 350–4. 50 U.S. Patent Office, Subject Matter Index of Patents for Invention… Granted in France, Washington, D.C., 1883. Paris Universal Exposition, Reports of the U. S. Commissioners, Washington, D.C., 1867, iii, p. 469. Paris exposition Universelle Internationale, Rapport Général, Paris, 1889, iv, p. 532. At the Centennial Exhibition held at Philadelphia in 1876, Group XXV comprised ‘Instruments of Precision, Research, Experiment, and Illustration’. 51 Francoeur, , ‘Rapporth… sur le théodolite de M. Gambey, fabricant d'instrumens de précision’, Bulletin de la Société d'Encouragement pour l'Industrie Nationale, (1822), 21, p. 151. 52 Harman, P. M., op. cit. (36). 53 Daumas, Maurice, Scientific instruments of the Seventeenth and Eighteenth Centuries, New York, 1972, p. 289. Middleton, W. E. K., History of the Barometer, Baltimore, 1964, pp. 89–90. 54 Pixii, , Catalogue des Principaux Instruments de Physique, Chimie, Optique, Mathématiques, et Autres a l'Usage des Sciences, Paris, 1832. Lerebours et Secretan, Catalogue et Prix des Instruments d'Optique, de Physique, de Chimie, de Mathématique, d'Astronomie et de Marine, Paris, 1853. Chevalier, Maison Charles, Catalogue… des Instruments de Physique Expérimentale, Paris, 1861. 55 Marbach, Oswald, Physikalisches Lexicon, Leipzig, 1850, pp. 244–78, offered as examples the physics apparatus of Emil Stohrer in Leipzig and Meyerstein in Göttingen, the optical instruments of Merz, Utzschneider & Fraunhofer in Munich, the microscopes of Schief in Berlin, and the mathematical instruments of Ertel & Sohn in Munich and Boller in Leipzig. 56 Gerhardt, C., Preis-Verzeichnis uber Physikalische Apparate, Bonn, 1893. Kohl, Max, Physikalische Apparate, Chemnitz, 1904. Leybold, E., Catalogue of Physical Apparatus, Cologne, after 1905. 57 Ritchie, E. S., Catalogue of Physical Instruments, Boston, 1880. J. W. Queen & Co., Catalogue of Physical Instruments, Chemical Apparatus, Chemicals and School Apparatus Generally, Philadelphia, 1881. Knott, L. E., Physical Instruments, Boston, 1912. 58 South Kensington Museum, Handbook to the Special Loan Collection of Scientific Apparatus, London, 1876, introduction. Chicago, Columbian Exposition, Katalog der Universitats Ausstellung, Berlin, 1893. German Educational Exhibition, Scientific instruments, Berlin, 1904, historical remarks p. 97. 59 Field, J. V., ‘What is Scientific About a Scientific Instrument?’ Nuncius, (1988), 3, pp. 3–26. 60 Simcock, A. V. (ed. ), Robert T. Gunther and the Old Ashmolean, Oxford, 1985. 61 Gunther, Robert T., Early Science in Oxford, Oxford, 1923–1945, and Early Science in Cambridge, Oxford, 1937. 62 Von Bezold, G., Wissenschaftliche Instrumente im Germanischen Museum, Nürnberg, 1899. Rohde, Alfred, Die Geschichte der Wissenschaftlichen Instrumente vom Beginn der Renaissance bis zum Ausgang des 18. Jahrhunderts, Leipzig, 1923. 63 Turner, Gerald L'E., Ninteteenth-Century Scientific Instruments, London, 1983, and de Clercq, P. R. (ed.) Ninteteenth-Century Scientific Instruments and Their Makers, Leiden & Amsterdam, 1985, begin to rectify this situation. 64 Robischon, Mary M., Scientific Instrument Makers in London During the Seventeenth and Eighteenth Centuries (PhD dissertation, University of Michigan, 1983), especially chapter 11. 65 Bryden, David, Scottish Scientific Instrument Makers, 1600–1900, Edinburgh, 1972, p. 33. Hackmann, W. D., ‘The Ninteenth Century Trade in Natural Philosophy Instruments in Britain’, in de Clercq, (éd. ), op. cit. (63), p. 77. 66 Thompson, Silvanus P., Life of Lord Kelvin, London, 1901, p. 239.